We only had one day in Nairobi and wanted to make the most of it so booked an early flight from Uganda (very early!) and arranged a tour guide to take us to all the sites. We were picked up from the airport at 9am by our tour guide and after a quick pit stop at our hostel we were on our way to the centre of Nairobi on a magical mystery tour (mostly because I'd booked the tour through our hostel and had no idea what was on the agenda!). First stop was the National Archive Museum, which to start with I thought was going to be a document storage place, but luckily actually turned out more to be like an African history museum which was quite interesting, especially as it had a lot of photos of the British Royal family and previous priministers. Next was the 91st floor and rooftop of the conference centre for a 360 degree view of Nairobi. Nairobi was a lot more built up than any other Africa city we'd been to, it was huge with buildings going on for miles. The city itself wasn't particularly attractive tho, and very busy. Our tour guide did his best to completely ignore us for most of the tour (so not really a tour guide, he was basically just a driver) and was on one of his 2 mobile phones the whole time, including when he was driving! He had told us we were going the parliament building and Uhuru park before finishing the tour, but then drove us straight to the park having totally forgotten about the parliament building, not that we were bothered it wasn't exactly top of the list of things we wanted to do anyway, we mostly just wanted to drive thru the city. The park was quite nice, a bit of tranquility with people chilling out on the grass, and a big pond with pedalos on it. The guide must have felt a bit guilty for his lack of communication with us as he seemed a bit more talkative while in the park, he even bought us a drink each! It didn't last tho, as soon as we were back in the car normal phone to ear service resumed. The next 2 things on the agenda I had asked for specifically as I'd found out about them during many google searches of things to do in Nairobi. The first of which was lunch at Carnivore restaurant, a fairly posh all you can eat meat place where they come round with all weird and wonderful meats on skewers and plates and you keep eating until you can't cope anymore! They had all the basics, chicken drumsticks, pork, beef in all different forms, but also had ostrich, crocodile and ox balls. Ostrich steak is actually really nice, like beef with a bit of a twist. I wasn't that fussed about the crocodile, very similar to chicken but quite gritty in places. The ox balls I didn't even try! We managed to stuff ourselves enough to feel satisfied but stopped short of needing to go home and lie down as we still had one final thing on the list before going home, feeding giraffes!! There's a giraffe sanctuary in Nairobi that has rescued giraffes which you can feed. They've built a wooden platform and you stand on it while the giraffes come up to you and lick food pellets off your hands! If you really want to (like Grant!) they'll lick it out your lips as well and give you a kiss!! Ergh... It was really well done, the giraffes also have a lot of land to roam around in and they are only there eating because they want to be, once they've had enough they just walk off. I've actually been really impressed with all the wildlife places in Africa, how well run they are, and how well the animals are treated, they have a real respect for animals, unlike some of the places we saw in Asia. I loved feeding the giraffes, i'd been looking forward to it for ages, ever since I discovered in Kruger that I've got a real soft spot for giraffes, they are so simple and stupid looking, so cute! We finally tore ourselves away when loads of kids turned up and took over, and headed back to our hostel to chill out for the evening ready for yet another early start! 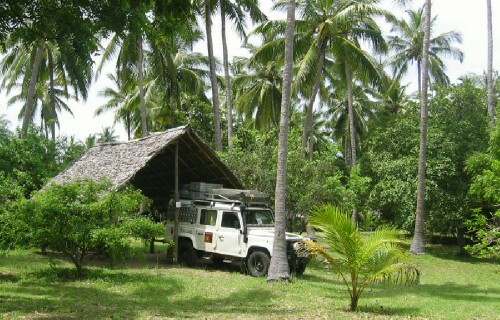 The next day was the start of our 3 week overland tour through Africa. We were up early and got a cab to the starting hotel (which we hadn't stayed in as it was about 3 times more expensive than the hostel we booked) and found our overlander truck in the car park. We were about 30 mins early so had a bit of a wait until the others joined us, but that gave us time to give our transport for the next 3 weeks a bit of an inspection. Unfortunately we came to the conclusion it was about 5 years past its sell by date and not at all the truck we had been sold by the travel agency! It was practically falling apart, the chairs were small, uncomfortable and dirty, and there were no personal lockers which we'd been told about. Still, trying not to get the tour off to a bad start we tried out a few seats, found the best ones, and sat waiting for the rest of our group to join us. The 2 things we didn't want were kids on the truck (not when your driving up to 12 hours a day!) and at least some English speaking people as we had been warned that the tour company we were using were popular with Germans and Dutch. Luckily when everyone was on the bus there were no kids, and although there were quite a Germans there was also Australians and Kiwis so it kept most of the conversation in English. The group were a little older than expected, most of the group were late 40's / early 50's with a few in their 30's and us actually being the youngest which surprised us, but that actually ended up being a good thing as we soon discovered we would be up at 5am most days and had no interest in being on a party bus!! They were all a lovely bunch of people, and we all got on really well. We got on the road by 8.30am (bouncing all over the place, Jimi - the truck's name - did not have the best suspension either) for a long drive to Arusha across the border in Tanzania. We arrived in the late afternoon and checked into our rooms. I was expecting a bit of a s*** hole, especially as the tour was cheap and the places we'd driven through didn't exactly look geared up for tourists, but in actual fact the room was lovely, with a massive bed in it and zebra themed bed spread. The truck came equipped with everything we needed to cook dinner (I say we, I mean the guide, although we did help with chopping vegetables and washing up) including tables and chairs, so for dinner we all sat by the truck in the garden getting to know each other. The next 4 days we were off on a safari excursion to the Serengeti, and after a slightly heated conversation with the guide on the price he was telling us compared to what we had been told previously, we were off for a 6 hour drive in a thankfully comfortable jeep. On the way we stopped at a snake park, which although interesting was fairly sad due to the size of the snake cages, I did get to hold a baby crocodile tho :-) and also visited a Masai museum to see how traditional Masai people lived in Tanzania. They basically haven't really been touched by modernisation and still live as they did 50 years ago in tiny mud huts, with only animal meat, milk and blood to live on. Some of them did have mobile phones tho which spoilt the traditionalness somewhat! When we arrived at our camp in the Serengeti later that day, I was surprised to see how open it was compared to Kruger Park. It was a basic camp site with everyone in tents and there were no fences around the camp at all. As soon as we arrived we were given a speech about not getting out of our tents in the night as animals often wandered around, and although supposedly animals wouldn't come into the tent if it was zipped up, no food should be kept in the tent, a bit random! We're probably not getting any sleep tonight then as we listen out for wildlife! We had some porters with us on the 4 day Serengeti trip and they set up our tents and cooked all our meals. Considering we were in the middle of no where they did an amazing job. The dining hall consisted of an area that had been caged off, with camping tables and chairs set up in it. Dinner was soup to start then a massive amount of mains, normally veg, rice and meat with fruit for dessert. We all sorted our stuff out in our tents then headed to the dining hall, but were intercepted on our way there by our guide telling us that lions had killed a buffalo just behind the dining hall and that hyenas were hanging about trying to scavenge some meat. Animals really did come into the camp site then!! We all stood in the dining hall trying to spot the lions, I couldn't see them, but I could hear them and they were pretty close! Some nutter people even went outside looking for them! Think they'd forgotten they were dangerous animals! It was already pitch black dark by this point so after dinner there wasn't much to do but go to bed and hope the lions didn't get us. Our tents had been set up right on the edge so we felt a bit vulnerable, especially as we seemed to have about 6 hyenas hanging about right behind us! We could see their eyes in the dark staring at us, freaky! One even ran right past our tent trying to work out if we had any food!! Surprisingly we actually managed to get a decent nights sleep that night, we were pretty shattered from the long day. I did wake up about 3am to the sound of what I thought were hippos behind our tent, and later found out that they were lions and people in other tents had been freaking out, but luckily for us it was pretty uneventful! When everyone was up in the morning we were served a lovely massive breakfast and were off on our first game drive. The Serengeti was totally different to Kruger Park, a lot more sparse and dry with lots of different dirt tracks, and no paved roads. There weren't many cars about, and those that were there were tour company jeeps, there wasn't anyone doing self drives like we did in Kruger as far as we could see. Not surprising really due to the road conditions and the fact that there were no road signs anywhere and it would have been pretty easy to get lost! We drove around the park for about 30 minutes not seeing much and then came upon a leopard sitting in a tree just above the road. It wasn't remotely bothered that all the cars were there watching it, and kept moving about a bit as if to give all of us a bit of a view! It was pretty cool, they are beautiful animals. Within the next hour we'd seen 2 more leopards in trees, it took 5 days in Kruger to see a leopard and we saw 3 in the first hour in Serengeti! The rest of the morning was fairly successful too as there seemed to be lions everywhere, Serengeti was obviously the place to be for cats! After a 3 hour game drive, we headed back to the camp for some lunch then while waiting for an afternoon game drive, chilled by the tents playing cards and drinking wine from a box we bought, drinking out of glasses we'd made by cutting up a plastic bottle as we didn't have anything else! The afternoon game drive was pretty similar to the morning one, we saw lions, a couple of cheetahs, elephants, buffalo, giraffes and zebras. It's difficult to still sound excited about seeing so many animals by this point as we'd been on a fair few game drives, but it was still awesome, you never know what your going to see just round the corner! When it got dark we drove back to the camp site for dinner, this time with no lion or hyenas visiting and managed to sit outside our tents for an hour chatting before heading to bed. All was going well was until we were woken up about 4am by some groaning noises, which again I thought were hippos (they weren't) and then again at 5am by someone screaming "stay in your tent, there are lions in the camp!!" and the sound of people scurrying back to their tents and cars driving around trying to scare the lions off! When we eventually got up an hour or so later we were told that a pride of lions had been in the camp and were found in the toilets looking for water! 2 cubs had been playing with tent cords near the toilet building and had clawed there way into a tent!! Good job lions don't come into your tent when they're zipped up then!!! No one was hurt tho, the girls in the tent had some how slept thru most of it apparently! After all the excitement of finding out what had been going on, we packed up all our stuff, as we were moving camp site to one on the Ngorogoro crater, and after a quick flat tyre change went off on another drive through the Serengeti. This time we came across a lion about 2 meters away from the road who had just given birth to a tiny cub who she was feeding, and we all thought ahh how sweet. Unfortunately we soon realised that the lion wasn't well, she had cuts all over her, and she moved away from her cub into the shade leaving her cub where it was in the blazing sun. As we watched we noticed 3 more cubs she had hidden in the grass behind her and it slowly sank in that if she'd abandon her cubs it meant she was probably on her last legs and the cubs weren't going to make it either, it was really sad. There were 2 male lions sitting about 10 meters away across the road and they just sat watching the whole thing before getting up and walking off without helping the mother at all. Presumably they just realised it would all be over soon and the mother or cubs were no good to them now. Really sad but I guess that's the way it goes in the wild. We did ask our guide to report it to the rangers but he didn't, just saying that they wouldn't do anything to intervene anyway... It put a dampener on the morning as you an imagine! I wanted to get out and pick the cubs up! We left the Serengeti national park (and changed another flat tyre, well actually the same one, the guide had replaced the previously flat tyre with another flat one - he was a bit useless all round truth be told, as a driver and a guide) and headed toward the Ngorogoro crater. On the way we stopped at a Masai village to be taken round by locals and shown how they really live compared to what we had been told by the museum. It was pretty similar, they lived in tiny little mud huts, which this time we got to sit in (hot, smelly, dirty! Poor people) with all the huts being built in a circle round a central point in the village. They call it a village but there were literally about 20 mud huts and the nearest shop was at least an hour walk so it was more like a little settlement. All the 'villages' in Tanzania were like that. One thing we did learn from our tour guide is that all the practices that have been banned by the government still go on, like female circumcision and lion hunting to prove you are a 'warrior'. The museum told us that these things didn't happen anymore, but I guess that's just what they have to tell us, as they very much do in reality. When we arrived they treated us all to a few dances (they made me get involved in one of them!) which felt a bit staged but was quite cool to see, and then showed us round the village and in the mud huts. After our tour they then started the hard sell. Tourists, especially anyone white, are thought of as being so rich (which compared to them we obviously are!) that at every opportunity they try and persuade us to buy stuff or donate money, the kids have been taught to beg whenever they see us, and some of them get quite angry when you don't comply! It's the same every where with every tour you do, and even walking along the street. They pretend to be all nicey nicey then get out all this stuff they want you to buy and charge you a ridiculous amount for it (like $30 for a bracelet made of string) thinking you should buy it just because you can. Then even when you've bought something out of guilt, that's not enough, they think you should buy more. It is very sad how poor they are, but after a while you get hardened to it, especially as most of the time the people who sell you stuff are the ones who con all the many tourists that come along and aren't actually the ones that need the money. It makes you avoid locals altogether after a while or you end up being rude and ignoring people when all the 'no thank yous' don't work. We eventually bought 2 bracelets from our guide, at a dramatically bargained down price, and were taken to the kindergarten hut, where we had to donate more money (bearing in mind we had already paid a fair whack for the tour in the first place) and then got guilted into tipping the guide before we eventually escaped back to the jeep. When we finally got to our camp in the Nogorgoro crater we were stunned how gorgeous the view was, it was right at the edge on the top of the crater and luckily we'd arrived in time to see a beautiful sunset. We headed off for showers, walking past a group of zebras that had decided to come investigate the camp, and then all sat round on camp chairs, with our box of wine, watching the sunset before dinner. That night we had been warned that there were elephants near by and that wild pigs often tried to get into tents at night so to keep nothing that would interest then in our tent, including food, toiletries, and chewing gum and to lock them all in the jeep. Our tent was right at the edge of the camp and although we managed to get off to sleep fairly quickly, were woken up at 2am by something scratching at the side of our tent! It was pretty windy too so we couldn't work out which noises were animals and which was the wind and I managed to totally freak myself out and didn't sleep for the rest of the night! I was actually pretty pleased when it got to 6am and I could get up!! Funny really, I slept fine through 2 night of lions and hyenas but then got freaked out by elephants, zebra and wild pigs!! For our last morning we went out on a final game drive this time on the Ngorogoro crater. The crater as the name suggests is the top of a volcano and is densely populated with all different types of game and wildlife. It's where the buffalo and zebra cross as part of the big migration to Masai Mara. It is totally flat with hardly any trees or bushes, so it makes viewing the wildlife really easy, and everywhere you looked you seemed to see something! We drove around for about 3 hours and saw loads and loads of buffalo and zebra all walking in a line which was quite cool presumably migrating, and hippos, wathogs and wilderbeast, before getting yet another flat tyre - yes the same tyre - and having to get out in the middle of the crater while it was changed, keeping an eye on a lion about 100 meters away! The only thing we didn't see was rhino, and although we chased what we thought was one for a while, it never came into clear view. Rhinos were definitely the animal we saw least in all of our game drives. Eventually it was time to leave and drive the long 6 hours back to Arusha and back to the same hotel we had before.